sample image Switch in gearbox for reversing light for CX1 every model, Mehari 4x4, Talbot Solara. Measure: M12x1. 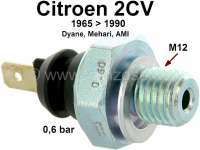 sample image Oil pressure switch for Citroen 2CV starting from year of construction 1965. Response pressure 0,60. Thread M12 x 1,50. Electrical connection: Flat plug 6,35mm. sample image Oil pressure switch for Citroen 2CV6, Installed starting from year of construction 1965. Response pressure 0.50 bar. Thread M12 x 1,50. Electrical connection: Round plug 4mm. sample image Oil pressure switch, suitable for Citroen ID19, DS19, HY petrol. Citroen 2CV + AMI6 without oil filters! Thread: M14x1,5. 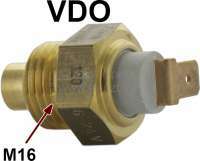 sample image Oil pressure switch, suitable for Citroen Visa 652. Response pressure: 0,5 bar. Thread: M12x1,5. Length of thread: 25mm. sample image Sender for an auxiliary oil temperature instrument (VDO). The sender is mounted in place of the oil drain screw. Suitable for Citroen 2CV.